We counted roadkill on the Oklahoma roads. 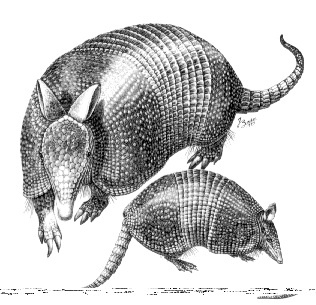 An armadillo lay belly-up, with only the curve of its shell terra-bound. As we passed the armadillo a bald eagle circled ahead, making slow moons above the armored animal the Aztecs call turtle rabbit. I saw the eagle in the rear-view mirror drawing down upon its prey. This entry was posted in american indian, authenticity, Indian, Indian relocation, native american, native press, Native Science, Osage, writing and tagged American Indian, Native American, native science, roadkill. Bookmark the permalink.